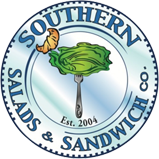 Southern Salads and Sandwich Company is located in Rock Hill and NOW Fort Mill. We serve Fresh, Homemade Food that is Fast, Health Conscious and Delicious. Our Fresh Ingredients and Original Recipes are Made Daily to Seamlessly Compliment Your Lifestyle. Our Hearty Sandwiches are made with only the Choicest Meats and Fresh Vegetables. Southern Salads also creates Uniquely Satisfying Salads with Homemade Dressings. And of course, we can't forget to mention our Famous Homemade Pimiento Cheese and CHICKEN SALAD. We also Specialize in OUR OWN Smoked Carolina BBQ, including Sauce Recipes from each region as well as a NEW Recipe of Our Own. Taste Our Food for yourself at Rock Hill and NOW Fort Mill's Favorite Place to Meet & Eat.